Welcome to Our Web Page. 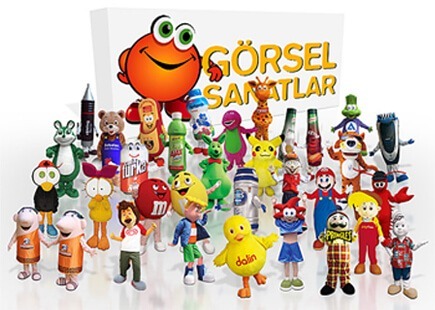 With 20 years of experience behind, Görsel Sanatlar (Visual Arts) is one of the leading companies in mascot costume production and the first of its kind in Turkey. The professionals at Görsel Sanatlar will be by your side. We produce world-class character and product mascots for every need — from brand marketing campaigns and sports tournaments to retail and entertainment venues.Call us for characters and product mascots, theater and stage scenery, indoor/outdoor mock-ups, and playground and activity spaces.. The main purpose of a mascot is to represent your organization successfully. Also, for organizations that are constantly changing, mascots provide continuity and consistency. A mascot costume will enhance your brand identity and marketing message. Mascots draw attention wherever they appear. Visually interesting and innovative, they’re more likely to attract media coverage. They engage your audience. No matter who you’re targeting, children or adults, everyone likes mascots. Compared with traditional advertising methods, your campaign is more effective with a mascot. People remember mascots, so your message is more memorable.